Legendary Finnish soprano Aino Ackté was born in Helsinki on April 23, 1876. Aino Ackté received her first lessons from her mother, mezzo-soprano Emmy Achté, who had a strong influence on the life of her daughter, and on her choice of career. On her debut in Helsinki at the age of 17, Aino astonished the audience with her pure voice and the technical maturity of her singing. In 1894 she was admitted to the Paris Conservatoire, where her teacher was Edmond Duvernoy. While studying in Paris, she changed her surname from Achté to Ackté, to stop the French from making fun of it (in French, "acheté" = "bought"). Her debut at the Paris Opéra was in 1897 as Marguerite in Faust. It was an enormous success, and the Opéra became her home stage for the following six years. From 1904 to 1906 Ackté was engaged by the Metropolitan Opera in New York. 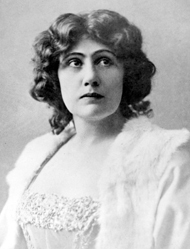 Ackté's second treasured role after Marguerite was the lead in Richard Strauss' Salome, and she created the English-language role at Covent Garden with Sir Thomas Beecham in 1910. Aino Ackté ended her international career already in 1913, but she continued making appearances in her homeland. She focused her energies on enhancing the status of the opera in Finland. In 1911, she had joined Edvard Fazer and Oskar Merikanto to found the Domestic Opera, which later evolved into the Finnish Opera and today's Finnish National Opera. Years later, in 1938-39, she again accepted the post of general director of the National Opera on a one-year contract. However, her most remarkable achievement in the field of Finnish opera was almost certainly organizing the Opera Festival in Savonlinna from 1912 to 1916 and again in 1930. The aim of the festival was to make new operas by Finnish composers accessible to everyone. Aino Ackté died in Nummela, Vihti on August 8, 1944.